"In this Delicious series game, the player is dropped into the center of the ever present 'battle of the sexes', and boy are these skirmishes fun. We join Emily as she tackles the struggle of being a functional working mother. She tries to balance her fulfilling home life with her creative and stimulating work life. At the same time Patrick is attempting to ease things for Emily by helping with the kids, but is that really as easy as Emily makes it look? 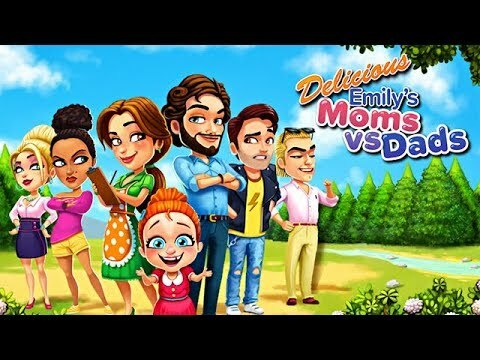 In Delicious: Emily's Moms vs Dads, it is we the players who decide. We vary in whose side we take up as the moms in Emily's circle challenge the dads (as well as a granddad or two) to face the challenges of work life and raising kids. It's up to the player to meet the challenges and keep everything from falling apart in all areas while completing engaging episodes. The chapters are entertaining and invigorating and I highly recommend this game." Emily is thrilled with her family, but with three kids, it seems there is ten times the work. Balancing work in the diner, her cooking vlog, chores plus the family is getting harder and harder. When she notices Patrick acting like occasionally playing with the kids is doing his fair share, she’s had enough. Her girlfriends all have similar experiences - men who don’t help out in the house unless asked, men who only babysit their own kids, and they’ve had enough. It’s time to act, to show them how much work it really is. Can the girls get their men dashing around the house, or will this end up being a recipe for disaster? The moms are testing the dads’ mettle in this fun take on an age-old debate. Who will end up victorious? Delicious Emily games are favorites of mine! I wait anxiously for a new one to be released each time I finish one. Moms vs Dads has to be my favorite one yet. Entertaining and something new with each day! I have played all the Delicious Emily games so far. They entertain and stay fun regardless of the episode. Easy to fall in love with the characters and it keeps my fine motor skills in check. I had a brain tumor removed in 1999 and the neurosurgeon suggested computer and video games to improve fine motor skills, so there you go. Straight from a real doctor, games can be good for you! I love this game. I own all Emily's games and always look forward to her new games. I stayed up late playing the first part and am ready to start on the second level. This is my Christmas gift and I love it! Enjoy this game so much, it gets more involved as you move through it and improve your skills. Great way to use up time while waiting. I've put it on all my devices. Highly recommend. Can't get enough of playing it! All of Delicious Emily's games are so fun to play. The story lines are interesting too. This game is fun to play. Always love the Emily series! Characters are like old friends. Good story. I really really like this game. I loved that it's a bit challenging and not so easy to play. I highly recommend this game. I truly love this and all the games I bought. They are amazing and I play them all the time. I truly hope they come out with more of them very soon! This game is great just like the others. Challenging. A good play. Looking forward to more adventures from Emily and her family and friends. This is a new twist on the Delicious games. I have enjoyed playing it so far. It plays like the other Delicious games but with different goals. I really loved this game. Very addictive and full of real life events. Keep making more Delicious Emily games! Excellent game. Very impressed with the graphics, and the game content is excellent. I absolutely love the Delicious games and this did not disappoint. Great graphics and game play. Looking forward to seeing more! Excellent. There are many objectives that are fun and challenging. I wish that the easier mode of play was still an option.